Collegiate recreation has the power to impact and influence students’ leadership efficacy through involvement of its programs and services. University Recreation Club Sports is designed to provide students with management and interpersonal opportunities that require those in leadership positions to be responsible, organized and dedicated to the success of their club. One such example of leadership development stems from the UREC Water Ski Club. Madison Hayden, a University of Arkansas senior and captain of the UREC Water Ski Club, has received the national 2017 Outstanding Female Leader Award. This prestigious award, sponsored by the National Collegiate Water Ski Association, recognizes students who go above and beyond their assigned duties and responsibilities and make a meaningful contribution to the sport. Hayden’s journey toward recognition has not seen an easy path. In 2015, Hayden volunteered as captain of the club when it was in danger of becoming extinct. The team was not well known locally or regionally and did not have many club members. “When Madison took over, the team was teetering on the edge of chaos,” said Roger Boskus, UREC water ski club advisor. Hayden has taken the team from a social club to a competitive team that attends and facilitates tournaments, and recently qualified for nationals. Hayden created a baseline for organizational functions that had never been in place before with regard to budgets, regular practice hours, goals for the team, and regular team meetings. 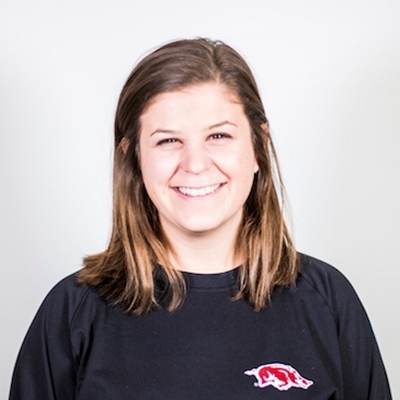 Hayden’s success as a leader culminated in the fall of 2017 when she helped facilitate the UARK Hog Wild Tournament at Bullneck Lake in Scott, Arkansas. The event helped raise $4,000, most of which was used to help purchase new equipment for the club. Competitive collegiate water ski teams from Louisiana, Texas and Missouri were present, with Arkansas finishing in fourth place out of eight teams. “In 30 years, the team has never been this competitive,” said Boskus. Hayden is described by her teammates as their biggest cheerleader and supporter. “When she asks something of people, they do it because they want to and because she asked,” said Rachel Gawlik, fellow water skier and friend of Hayden. Upon graduating, Hayden hopes that the team will continue with the same upward trajectory while still remembering to have fun.